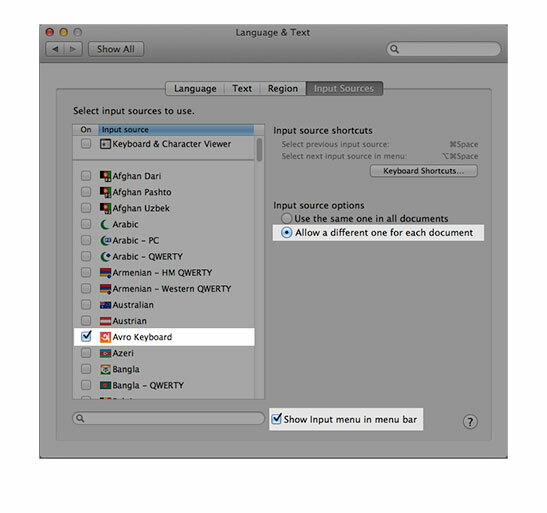 Go to System Preferences, Keyboard, Input Sources and add Avro Keyboard. ⁃ Show Input menu in menu bar: Input menu will be visible on menu bar. ⁃ Automatically switch to a document’s input source: Input method usage will be tracked on different documents. If you uncheck this, same input method will be used globally in all documents. 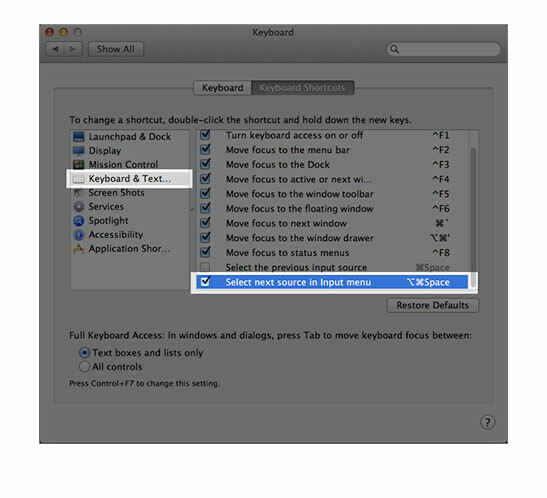 To select a shortcut for switching input methods, go to System Preferences, Keyboard, Shortcuts, then select Input Sources, enable Select the previous input source item. You can customize your preferred shortcut here. 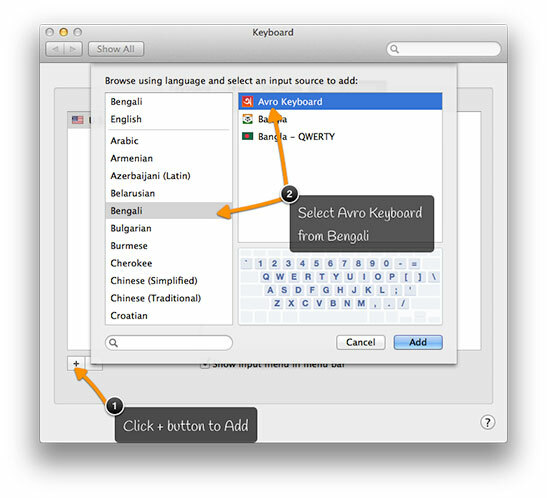 Go to System Preferences, Language & Text , Input Sources and select Avro Keyboard. 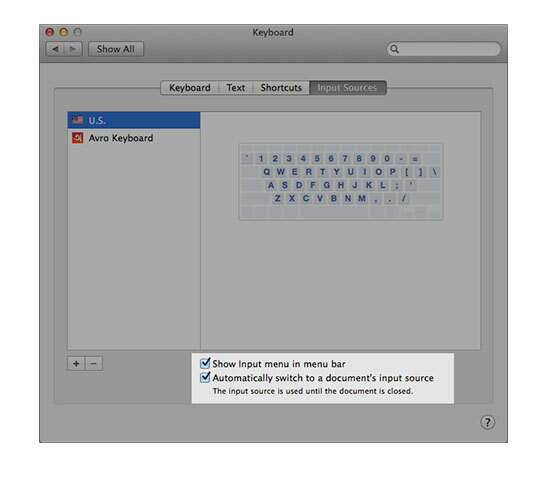 ⁃ Allow a different one for each document: Input method usage will be tracked on different documents. If you don’t select this, same input method will be used globally in all documents. 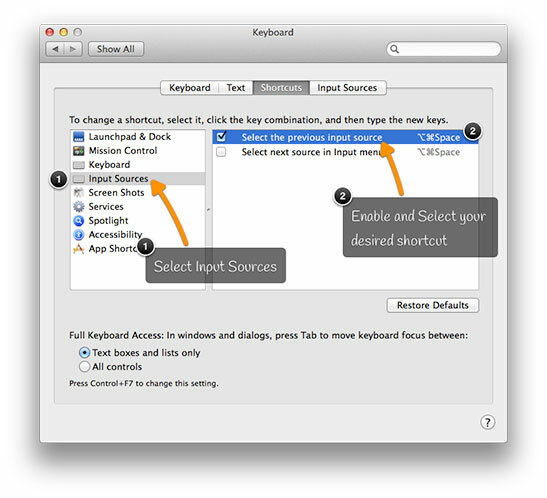 To select a shortcut for switching input methods, go to System Preferences, Keyboard, Keyboard Shortcuts, then select Keyboard & Text Input, enable Select next source in input menu item. You can customize your preferred shortcut here.